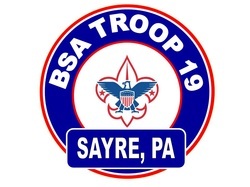 A warm Boy Scout welcome from Troop 4019 of Sayre, Pennsylvania and thanks for stopping by our website. We hope you'll find the information here both useful and practical whether you're interested in Scouting, camping, or the history of our troop. Troop 4019 is sponsored by the Church of the Redeemer. Meetings are held Wednesday evenings from 7:00-8:30 PM in Fellowship Hall. Troop 4019 welcomes all new members and visitors. All boys age 11-18 are welcome to join. Please stop by during any weekly meetings to learn about our troop or to meet our scouts and leaders. The Boy Scouts of America, BSA, is one of the nation's largest and most prominent values-based youth development organizations. The BSA provides a program for young people that builds character, trains them in the responsibilities of participating citizenship, and develops personal fitness.